Compression socks, also known as compression stockings are elastic garments worn around the legs. What makes them different from ordinary socks is the design mechanism. They are specially designed to apply pressure to the lower part of the legs. In doing so, the socks help to maintain blood flow, in addition to reducing swelling and reducing any discomfort. Check out this article for more benefits of wearing compression socks. In this article, we review the best compression socks for nurses. Of course you still need a good pair of nursing shoes to compliment compression socks. Check out our article on the top 10 nursing shoes. 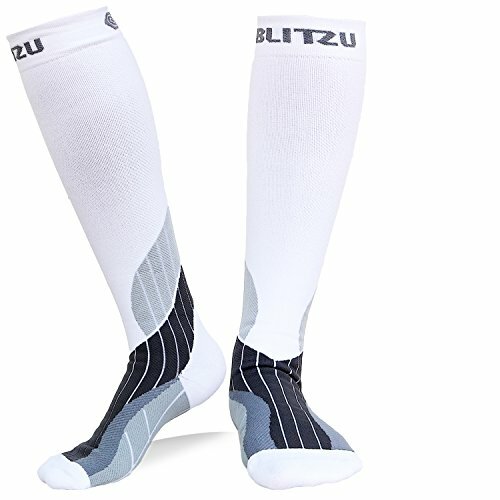 This sock comprises of 70% silver Drystal, 10% spandex, 10% nylon and 10%lycra.The silver drystal is an antibiotic fiber which reduces the growth of bacteria and fungi through moisture wicking creating a healthier environment for legs .This also ensures that feet remain dry which helps to avoid blisters. Its style is engineered with technical features that work perfectly together to create better blood flow to your feet. It therefore reduces foot and leg swelling and fatigue and also provides shin splint relief and calf support. The use of a patented graduated compression system with higher stretching allows easy wear compared to other traditional medical socks in the market and makes them a perfect fit and comfortable. Unlike some competitors, the material is machine washable. Add the fact that it’s also machine dryable and you have yourself one of the best compression socks for nurses available. This sock is recommended for all day every day wear due to its moderate (15-20mmHg) Graduated Compression. It is made of 32% Merino Wool, 32% Stretch Nylon, 31% Bamboo Rayon, 5% Spandex. 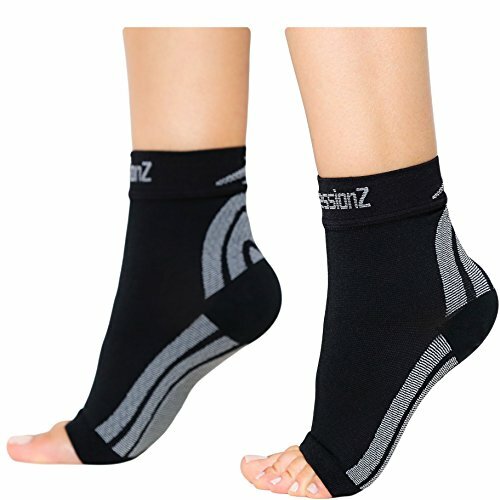 It offers arch support and has an ultra-light cushion sole which provides a great fit and incredible comfort .The arch support and accu-fit technology consisting of spandex throughout the socks helps maintain a perfect fit and keeps the socks in place ensuring a snappy fit throughout the day. Unlike other socks, it offers a turn welt top and seamless shoe closure with reinforced toe and heel box which helps keep the socks in place throughout the day. This also means that the socks maintains the same fit at the end of the day as when it was first pulled on. Its incredible features and comfort make it recommended for prolonged sitting or standing, flying and travelling, exercise and recovery since it minimizes and eliminates swelling of the feet. It is therefore an all-day every day wear. This make comes micro-brushed in the toe area to avoid chaffing in the toes. This means they are ideal socks to spend long hours in. This socks are medical grade and offer a great fit and guarantees no slipping. 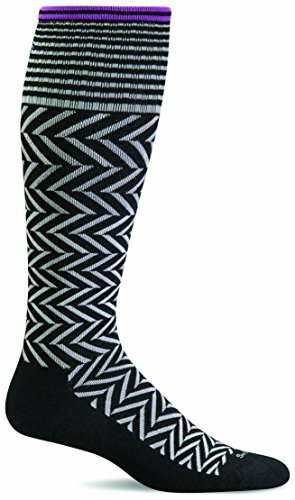 To suit the needs of most women, this socks feature a moderate graduated compression rating of 15mmHg to 20mmHg and to top it all off they are machine washable for easy care. For those with plantar fasciitis this socks are simply heavenly. They provide ankle support and heel arch support and sleeve for relieving chronic pain and discomfort. 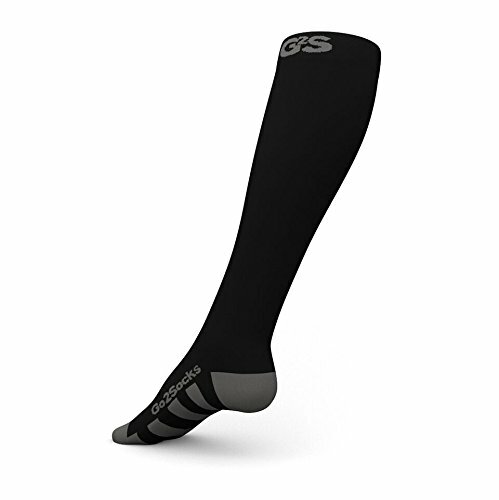 The foot sleeve does not limit your movement and are therefore perfect for running. In addition, this toe-less compression socks wick away sweat from your feet keeping them dry and cool. They provide the perfect level of compression on every region of the foot and offer support like a flexible foot brace that reduces injury risk. It also has a heel hugger fit to maximize blood flow all the way to your toes. These socks are some of the best compression socks for nurses suffering from plantar fasciitis. This socks are perfect for jobs that require you to be on your feet a lot. Nurses 101. What makes this the case is the BLITZU® kinesiology taping design with the performance of compression fabric. This provides excellent relief for swelling issues in the legs, and varicose veins making them some of the best compression socks for nurses you can find. The material has compression therapy technology promotes blood circulation and oxygen flow, prevent cramping, fatigue, swelling and helps in muscle recovery. They are therefore ideal for long distance travelling whether it’s on a flight or a walk. This high quality material is made of power+ premium performance fabric. The superior grade circular knit structure delivers 360-degree stretch for greater flexibility and durability. They provide a soothing feeling at the sides and the bottom of foot with no pinching. These are a must have for men and women at any age! 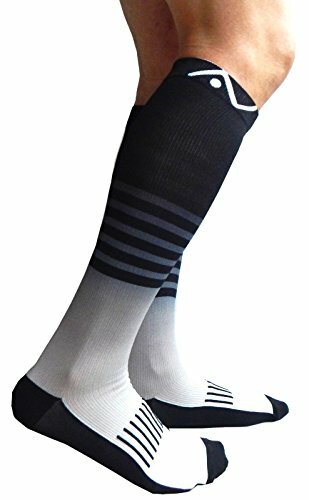 This socks are a complete revelation when it comes to those physically demanding jobs which require long hours of standing up, pregnant women. They relieve muscle fatigue and helps to achieve a much slimmer leg outline. 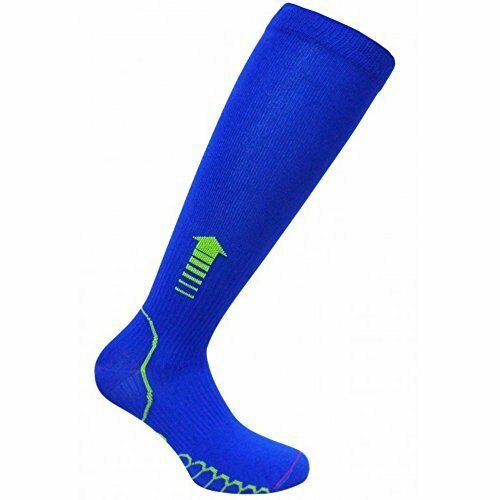 These high quality fashionable compression socks are made with a perfect balance of compression and comfort using the latest 3D knitting technology; an extraordinary design that easily slips onto your feet and allows a long lasting usage. Their ability to maintain their compression level even after washing several times is amazing and they even dry off quickly! A breathable fabric helps to regulate temperature making it perfect for any season. The fabric is also anti-odor and anti-bacterial and therefore it enhances hygiene. 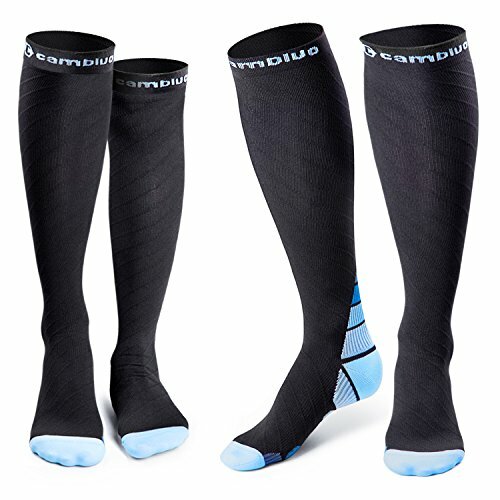 The socks also have a therapeutic pressure design which means they have strong compression at the ankle, and gradually decreasing compression when it comes to the calf area. All these are the qualities you should look when trying to find the best compression socks for nurses. This pair also comes with the graduated compression feature for optimal circulation. The sock is tight around the ankle and gradually decreases upwards towards the calf area. As a result, there is better oxygen circulation which helps reduce lactic acid build up and aids muscle recovery. The material used to make it wicks moisture away and is breathable this makes it anti-fungal and anti-odor. This means that it stops the growth of bacteria, deodorizes and keeps you dry for longer. I t also regulates temperature by keeping you warm when cold and cool when hot. This sock reduces muscle fatigue especially if you spend a lot of time on your feet or when travelling. This makes it ideal for sports, hiking and for everyday wear. It’s also a good fit for those looking for the best compression socks for nurses. These socks, designed for both men and women are designed for comfort. Their made from the best fibers that control the moisture in feet and legs hence keeping them dry. They improve blood circulation which in return helps in faster recovery and improved performance among nurses and athletes. They are especially loved by nurses because they are designed to cut down abrasion and stress in your legs while providing that extra level of comfort they desire especially after standing for long hours. This enables them to reduce leg swelling and aids in faster recovery. They are also made with blended nylon infused fabric with silverstat to fight bacteria, odor and moisture. Finishing off our list of the best compression socks for nurses are these bad boys. They provide the maximum boost to your blood circulation which consequently helps reduce lactic acid build up and aids muscle recovery in your calf, feet, ankle and legs. They are carefully designed and manufactured with a cushioned heel and toe support to provide premium support, comfort, and relief without compromising your mobility. A form fitting and breathable fabric features maintain joint stability regardless of activity. The anti-odor and anti-static fabric stops the growth of bacteria and fungus, while wicking moisture/sweat away from your feet. This deodorizes and keeps you dry even with longer use. Hectic, busy, and long are adjectives that accurately describe a typical day in a nurse’s work-life. Comfort is a luxury that makes the day bearable. Finding the best compression socks for nurses can go a long way in helping with this. Essentially, they boost blood circulation which has a domino effect on the whole mechanism of the body. Muscle recovery is faster, in the feet, ankles and calf. This makes spending long hours on your feet that much more bearable. Joints are also much more stabilized and as a result injuries are much less likely.